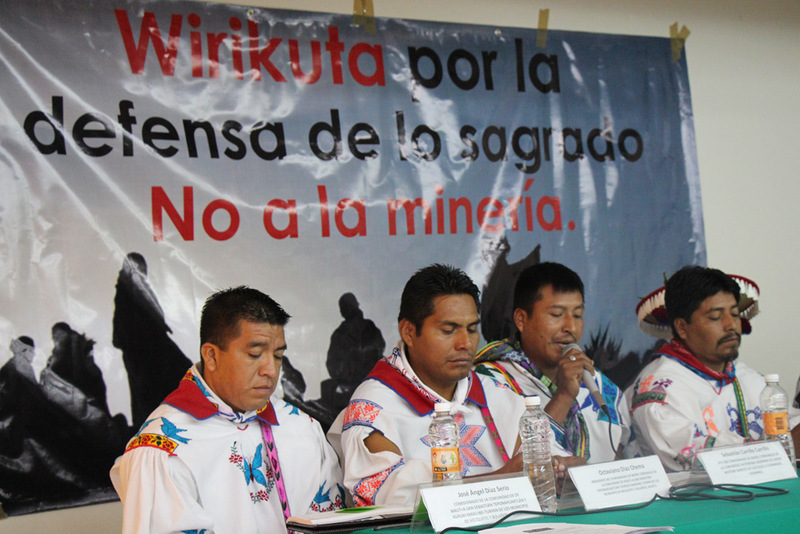 The Wixarika People of Mexico and all others who hold Wirikuta to be sacred are celebrating a major legal victory with the announcement of the suspension of all work on mining projects in the territory. The federal court has granted the suspension of 40 mining concessions, including the Universe and La Mamora projects of Revolution Resources and Frisco Mining Group, in addition to the 38 concessions suspended in February 2012, the La Luz mining project of First Majestic Silver Corp. The Universe Project aims to develop mineral resources on 59,678 hectares within the Wirikuta Natural Protected Area, representing 42.56% of the total land area of Wirikuta. No work permit may be granted for mining concessions in the Wirikuta Natural Protected Area in San Luis Potosi until the legal case requesting an injunction against the concessions is resolved. This legal action, granted by the federal courts, stops all mining operations in the sacred territory of Wirikuta, which includes the municipalities of Catorce, Charcas, Matehuala, Villa de Ramos, Villa de Guadalupe and Villa de la Paz in the state of San Luis Potosi (about 140 thousand hectares), pending resolution of the revocation or cancellation of 78 concessions in the protected area and its surroundings. Given the federal suspension, no government entity, either Municipal, State or Federal, may grant any permit (for exploration or exploitation) for mining work to be carried out in the area, and the Mexican state authorities were urged to protect the area against acts of third parties that may violate this suspension. In order to comprehensively protect the sacred territory of Wirikuta from the mining and agribusiness threats, the Wixárika people had filed an injunction before the Federal Judiciary demanding respect for rights that the Mexican government has committed at the national and international level to protect. The territory of Wirikuta for the Wixárika People represents the place of the essence of life and the birth of the Sun. It is an indispensable element of cosmogony and cultural identity for their survival and continuity as an indigenous people of this country. Wirikuta is a living territory, indivisible and continuous, so it requires the protection of the territory. Failure to do so threatens the biodiversity, water quality and soil and the continuity of the Chihuahuan Desert ecosystem, and endangers the health and quality of life of rural inhabitants of this sacred place, to whom through this statement, the Wixárika People and civil society who make up the Wirikuta Defense Front send fraternal greetings for their dignified struggle against the mining threats. We reiterate that they are not alone and that together we can care for and preserve this heritage of culture, spirit and life for future generations. For Wirikuta, Matrix of Life, Sacred Heart of Mexico. Wirikuta is not to sell, it is to Love and Defend. Wixárika Regional Council for the Defense of Wirikuta. Wirikuta Defense Front Tamatsima Wahaa. via Mexico judiciary stops all mining operations in the sacred territory of Wirikuta.